Kids can often be challenging to travel with. Are we almost there? This is boring! Tell him to stop touching me! Most anyone with children can relate to these common statements heard while traveling. If you can put yourself in their frame of mind to plan out your travel, it’ll make the trips more fun for everyone. First, what are their ages? Depending on how old each child is, you’ll want to be sure to tailor basic things around this factor. Teens are going to bring more clothing. Teens and tweens want to look cool and so you can count on needing more suitcase space for the. Younger siblings will bring more “stuff,” so make sure they have a bit more space in the vehicle. Your teens will expect to have alone time, even when they’re with the rest of the family. Ear buds, smart phones and pillows are must-haves. Tweens and younger kids may be more open to watching movies and playing games while on the road from one destination to another. Having a portable DVD player or individual ones for the kids can be a real life-saver when you’re traveling long distance. Playing games with the whole family while on the road still seems to be the most popular way to make the time fly by! Let’s take a look at some of the most popular games to play while traveling. Name a food with every letter of the alphabet – everyone takes a turn at naming a food that starts with an A, then B….you get the rhythm. Find all the state license plates – this is a team game that can be spread out over the course of the entire trip. Designate your “teen” (if you have one) to be responsible for logging each state. There are even FREE apps to make this game fun for everyone. You can even add some trivia about each state as you add it to your list! What Am I? – Start with one person who thinks of an animal. Others rotate, taking turns asking one question at a time. Pay attention to narrowing down what the animal may be. If you ask a question, you can’t guess what you think the animal is. You have to use your turn for a single question or a guess. The Sign Game – Each person has to shout out a word they see on signs that begin with each letter of the alphabet, in order. This game goes by fast and can get loud, but it’s FUN! Word Association – One person begins with a word, and the next person has to name a word that’s associated. This continues from person to person until someone messes up. Then the game starts again. With all these ideas the trip with kids is sure to be enjoyable for everyone! If these ideas aren’t enough, check out these other games on BuzzFeed. When you get to your destination, ask in the RV office what activities they offer for kids. Stonebridge RV Park in Sweeny, Texas, offers corn hole, catch-and-release fishing, swimming and many more fun things. Staying connected while traveling is important to most people, so having available WiFi is a necessity. Whether you work from your RV, live in your RV full-time or are taking occasional trips, being able to connect quickly helps things run smoother. Although many parks offer this free service as an amenity, but, because of the number of guests trying to access it at any given time, it may be difficult to tap into it. The reasons may include obstacles such as trees or buildings in the way as well as limited or low-powered signals. Even when there are multiple transmitters, connecting can be fleeting. No-one wants to use up their data while on the road, so let’s take a look at some remedies. Check out these WiFi tips. A hotspot is a wireless access point, typically in a public location. You can access a hotspot from a smart phone or laptop. Many cafes, bookstores and other businesses offer hotspots so their customers can connect to the internet. It’s important to take security measures when using a hotspot, because they are public. By installing a VPN on your mobile device, your data will be encrypted, so even if you’re hacked, the information is impossible to read. An extender antenna is is a type of wireless repeater. This device may be used when the network signal isn’t getting to all the areas you need it to. Sometimes techies call these areas deadzones. A booster extends a signal by boosting or amplifying it. When you visit Stonebridge RV Park in Sweeny, Texas, you’ll find FREE WiFi to be one of the many amenities offered. The frustration of a good, available signal is frustrating at best. By trying one of the options list ed here, we’re confident you will find a solution that works best for your situation. Fun research and face-time with several groups of full-time RVers helped us develop this list of cool gadgets. We’ve also included links to where you can find these items. Please add your favorite items to our list by commenting below. Electrical Management System (EMS) Hard-wired or Portable – Surge protectors offer complete protection for any RV that uses 30 or 50 amp electrical service. Our faves are from Progressive Industries (hard-wired: EMS-HW30C / EMS-HW50C and portable: EMS-PT30X / EMS-PT50X). Freestanding stainless ice-maker by Igloo – No drain required for this plug-in model that can make up to 26 lbs of ice in 24 hours, perfect for an RV. Boil Kettle – Stop using propane to boil water when you have an electric kettle! We love Chef’s Star Borosilicate Glass Electric Kettle, 1.7 liter; it boils a quart of cold water in about 7 minutes. Portable Satellite Dish – We found the King VQ4500 Tailgater to be the most popular with the fewest negative remarks. Made specifically for RVers, you’ll love this luxury item. Instant Pot – Once you begin using this 6 quart, 7-in-1 multi-use pot, you’ll find it hard to do without it. This cooker will help you create some yummy meals on the road. Awning Shade – Whether you’re looking for a little extra privacy or a little more shade, you’ll love these new shades by Tentproinc. You’ll attach this to the front or sides of your awning. Trailer Hitch Stand and Hammaka Chair Combo – You’ll love lounging in these chairs that can be easily installed to a pick-up or RV. Wifi Connections – Really. All the time. All your devices. Check out WiFi Ranger. Water Pressure Regulator Valve – Renator makes the best and you’ll be glad you took the time to pack one of these devices. Hence, don’t start running the shower and kitchen sink faucets without it. Quick-Zip Sheets – It’s tough to put regular sheets on most RV beds, so we guarantee you’ll love Quick-Zip Sheets because they make bed-making hassle free! As you meet other travelers at Stonebridge RV Park or on your road trips, you’re bound to be introduced to other awesome gadgets that make rving a little more comfortable, so be sure and check back in with us and let us know if you’ve found something you think others will want to hear about. If you want a new adventure, then head to your nearest RV resort near Sweeny . RV life can open up a world of possibilities for you and your family. With RV park amenities, as well as the sights you see traveling the highways and byways, you’ll create a lifetime of memories. You Love Traveling, But Not the Hassle…Try RV Life! One of the biggest hassles of traveling is getting up early just to sit at the airport for hours. Sure, a plane can get you somewhere fast, but going through the hustle and bustle of airports and airplane travel can be exhausting. If you love traveling, but the idea of one more airport makes you feel stressed about your trip, then you may want to look into purchasing or renting an RV. You can travel anywhere your vehicle can go, which is most places in the world. As long as you can find an RV resort or somewhere else safe to park your RV, then you can have great vacations at your own pace without all the hassle. You Want to Save Money While Traveling…Try RV Life! Many people create a budget for their vacations; they figure out what they can spend at each restaurant, how much they can spend on activities, etc. What if you did not have to worry about restaurants, and you created your own fun in the great outdoors? With RV life, you can stock your onboard refrigerator and portable cooler with everything you need during your vacation. If you are taking an extended vacation, then stop at a grocery store. You will save hundreds compared to eating at restaurants throughout a vacation. Check out what Axle Addict has to say about analyzing whether you can save money living in an RV. You Desire More Outdoor Fun…Try RV Life! The idea of “fun” has changed over the past few years. Now, fun seems to be found only in expensive theme parks, fancy electronics, and social networks. If you want to bring your family back to a simpler time, then take them RV camping. They will find joy in hiking, canoeing, and roasting s’mores around a fire. Even traveling the open road in your RV can be a lot of fun as you see sites and landmarks around the country. 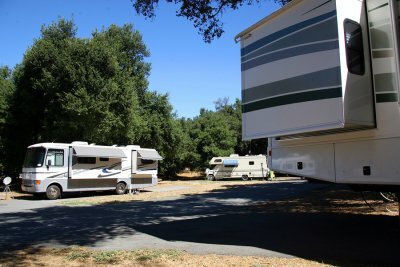 Have you been looking for the perfect RV Park for an RV park for your next long-term stay? Look no further than Stonebridge RV Park, your extended-stay RV park near Sweeny, Texas. With amazing amenities, beautiful landscapes, and exceptional rates, Stonebridge RV Park has quickly become a “home away from home” for many families and workers employed by area businesses such as Phillips 66, Zachry, S&B, Tenaris and many others. The RV Park is easily accessible! Located on TX-35 N between Bay City and West Columbia, you’ll find Stonebridge easy to get in and out of, and no traffic hassles. Take a refreshing swim in the pool, decompress in the hot tub, or sit around the fire-pit in the evening while your kids roast marshmallows and make s’mores. There is plenty of room to put up your favorite hammock and to lay back and watch the gorgeous stars at night. If you’re up for a little competition, break out the fishing poles and try your luck catching one of the monster bass in one of the two catch and release ponds. OR maybe a game of corn toss will liven everyone up. After all this activity you’re bound to be hungry. You’ll find BBQ grills under the big pavilion that are available for all guests. The pavilion is a great place to make new friends and to visit with the other families staying at the RV park. It’s important to stay connected while you’re on the road. You’ll be happy to know there is free WiFi and cable offered. And when you absolutely have to nothing else to wear, no worries, there is an on-site laundromat that is open 24/7. Keep in mind that Stonebridge is only 45 minutes from the world-renown Houston medical center and many, wonderful gulf-coast beaches. Your pets will find room to roam at Stonebridge. There is a big field out beyond the big pond where dogs can play and run themselves tired. There are also plenty of shady spots so they’ll be comfortable hanging with the family outside. If you’re staying a few nights or a week, the electricity is always included. If you’re staying on a monthly basis your electricity will be an additional, low cost per KW. Any way you look at it, you’ll find low nightly, weekly, and monthly rates that can accommodate almost any budget. The staff at Stonebridge is available to help make your stay as enjoyable as possible. They pride themselves on being responsive and friendly. Don’t hesitate to give us a shout by calling 979-245-1200 or via email at info@stonebridgervpark.com. Do you wish you could spend more time in the great outdoors? When you live in an RV, you can. It’s true that you’ll want to spend more time outside because of the relatively small interior space, but for the most part the RV campgrounds you’ll stay at will afford you the opportunity to go for a hike, soak in the views, or enjoy nature however you see fit. Ever wish you could spend your time doing anything else but mowing, weeding, and raking? Fortunately, you never need to worry about yard work when you move to an RV full time. RV parks take care of all grounds maintenance, and if you camp in national parks the overgrowth is a part of the natural beauty. In any case, when you say hello to the full-time RV lifestyle you can say goodbye to yard work. Another awesome benefit of living in an RV is the ability to go where you want, when you want, to take advantage of great weather all year long. Spend your winters out west, spend your summers up north, or pack up and leave whenever you find a specific place too hot, cold, humid, rainy, or dry. It’s that easy when you live in an RV full time. The Critical Cactus sums up the benefits of RV life in this frank, easy-to-read blog. Recreational vehicles allow people to get out and explore for a few weeks or a few months at a time. Buying an RV should be well thought-out and involve careful research. Having all the amenities you want and need inside a motorhome, campervan, or fifth wheel is vitally important so you can live on the road full-time if you are inclined to do so. Whether that means driving across the country throughout the year or setting up at a long-term RV park such as Stonebridge RV Park in Sweeny, Texas. 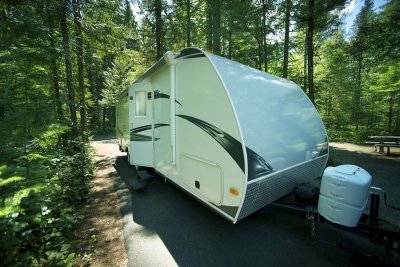 The first thing is to find the right recreational vehicle for your full-time living plans. Here are some tips. First things first: Make sure you fully understand your recreational vehicle options before you purchase one to live in full-time. Will this be a second or primary residence for you? Will you be spending part of your time in the RV or will you be full-timers? There are many different types of RVs to choose from, and the right one for you will depend on a number of different factors, including your lifestyle and budget. Class A motorhomes are the largest and most luxurious, but are also the most expensive and you’re limited where you can go in them. 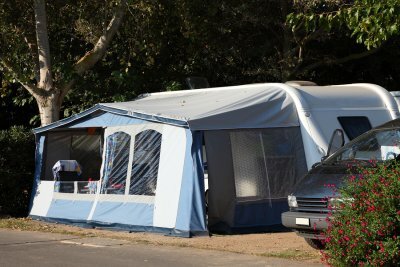 There are also travel trailers, campervans, and fifth-wheels to consider. As mentioned previously, your lifestyle will be one of the biggest determinants when choosing to live in an RV full-time. If you plan on moving from town to town and RV park to RV park, consider something smaller like a Class B or Class C motorhome that’s more maneuverable and fuel efficient. On the other hand, if you’re looking forward to dropping anchor at a long-term RV park and not doing much driving throughout the year, look for an RV that offers you the space, amenities, and the comfort you want and need, such as a class A motorhome. The best advice comes from people who are already living the lifestyle you can only dream about at this point. Visit RV dealerships, browse RV forums, or even take a drive to nearby long-term RV campgrounds and talk to other RV owners. Their experiences and tips that can help you choose the right vehicle for your needs. Anyway you look at it, buying an RV is a huge investment. One of the best ways to narrow down what you like and don’t like it to “try before you buy.” There are many RV rentals available throughout the country, in almost every city and small town. As you narrow down your decision, find a similar one available for rent and take it for an adventure. There is no better way to experience if you like it or not, than actually spending time traveling in it. So go ahead, rent several types first! There are so many reasons to stay at Stonebridge RV Park and Resort. Whether you’re looking for a place to visit for a few nights or you’re searching for an extended stay RV park, Stonebridge is the clear choice in Sweeny, Texas. Our staff is focused first and foremost on making sure you get settled in. We’re responsive to your requests and make it a priority to ensure that you enjoy your stay. Our refreshing swimming pool is a must. It’s HOT in our great state of Texas! You’ll find our pool is a great place for families to gather and meet other guests. We offer other numerous amenities above and beyond other RV parks in the area. An outdoor hot tub, BBQ grills, two stocked, catch-and-release fishing ponds and a vast pet-run area. Each concrete site has full hook-ups (30/50 amp). Guests have access to free WiFi so staying connected to your friends, family, work is no problem. Free cable TV is offered at every site so you won’t miss your favorite shows. The on-site laundromat is open 24/7 for your convenience and has plenty of washers and dryers for all guests. You can even sit back and read a book or watch a little TV while you wait on your laundry. Be sure and pick up all the supplies you need at the grocery store in town so you can enjoy roasting marshmallows over the fire-pit that will encourage everyone to gather around for s’mores. In the community lodge you’ll find the park office, but more importantly, there are movies and books that you are free to enjoy at your leisure. The lodge is a comfortable place to sit back and watch the world go by or to curl up in a corner and read your favorite magazine. Getting in and out of the park is a breeze no matter what size vehicle or rig you have. There are pull-through, pond-view and shady sites available. Guests love the natural beauty of the park. There are towering oak trees that provide lots of shade in the summer and turn beautiful colors in the fall. You can see our rates online at www.stonebridgervpark.com or just give us a shout at 979-245-1200 any time to talk with one of our team members. If you’re the owner of an RV, you will want to pay attention to this advice regarding important preventative maintenance routines to keep it running smoothly. As the spring approaches in Texas, you might be thinking about hitting the road in your RV with your family. One great place to make a reservation for a stopover is Stonebridge RV Park in Sweeny, Texas. Stonebridge is within an hour of beautiful gulf-coast beaches and the Houston world-renown medical center. But don’t make the mistake the taking off on your road-trip without ensuring you’ve done all the preventative maintenance on your RV to ensure you’re travels are as hassle free as possible. It’s not that unexpected things won’t happen, but by routinely caring for your vehicle, you’ll find trips to be more about having fun instead of having to deal with problems. Depending on where you’re traveling, parts and services are not all easily accessible. Once you make sure that your RV is running perfectly, you and your family can depart on a short or extended road-trip and take advantage of all the world has to offer. Watch this video for some tips on keeping your RV running smoothly. Following this advice, you’ll be ready for your next long-term RV camping trip. Many RVs have dual-batteries. Extend the life of your batteries by properly recharging. Check your batteries before each trip for leakage or crystallization, which may mean there is an issue. Radiator coolant should be checked before every trip. Antifreeze helps your RV in cold and hot temperatures. All hoses and clamps should be checked for cracks, breaks and leaks on a regular basis. Another good resource for a PM checklist for your RV was put together by the creator of RV University. You’ll find lots of tips on his website. No matter your source for implementing a consistent and thorough preventative maintenance routine, just be sure you keep it up on a regular basis. At Stonebridge RV Park , we’re committed to making sure that life for each one of our long-term guests is comfortable, enjoyable and hassle-free. Our extended-stay RV park offers affordable nightly, weekly and monthly RV camping rates. At this time, we do not allow tent camping. We also offer extensive amenities that will allow you to live in a quality atmosphere while saving money. Let’s look at each of our RV campground amenities. First, there is the sites themselves. Each one is level concrete, with full hook-ups (30/50 amp). Each guest has access to fresh water, electricity and sewer. These vital services allow our guests to live comfortably. Staying connected to to family and friends is important as well. Free WiFi is available to all guests. If you’re working remotely, we realize the importance of this service. Cable TV is also available free of charge. No need to miss your favorite shows or your best team playing. One of the amenities it’s always nice to have close by is a laundromat. Guests at Stonebridge love the spacious laundromat that is open 24/7. There is also room to watch a little TV or play a game of cards while you wait. You’ll find our on-site swimming pool to be a favorite place for all of our guests to mingle and enjoy floating around or playing water games. There is no better place to be in the hot Texas weather than in a refreshing pool. Adjacent to the pool you’ll find our hot-tub, the perfect place to help you wind down from your day. Guests are always welcome to grill out at their own site, but if you have a large group or want to invite friends and neighbors, there are two BBQ grills under the big pavilion where you can spread out. The picnic tables are just right for lunch or dinner. If you’re in the mood for a little competition, you’re welcome to set-up the corn hole game boards that are stored near the grills. Housed in the pavilion area, you’ll also find showers, restrooms and an exercise room. All are open 24/7. Kids will love making s’mores by the fire-pit, so don’t forget to stock up on graham crackers, chocolate bars and marshmallows! Two stocked fishing ponds will provide fun for all ages, so don’t forget your fishing poles. We practice catch and release, so there is plenty of action for everyone. Last, we are pet-friendly. Many RVers travel with pets, so we provide an open area out beyond our big pond where dogs can run around and play without bothering anyone within the camp sites. As most all parks, we require pets to be leashed inside any of the park grounds (except the back run), and require owners to be with their pets any time they are outside. One of the best articles to read about RV life is by Heath and Alyssa, who wrote a blog back in 2014 entitled The 29 Best Reasons Why Living in an RV is Better Than Living in a House…it’s sweet. It may make you wanna try it out! Our many resort amenities ensure that you and your family don’t have to waste time and money going elsewhere. We want you to kick back and enjoy life. So don’t wait to call us to reserve your spot, 979-245-1200. You’ll find our staff to be welcoming and focused on keeping our guests happy. You can also contact us at info@stonebridgervpark.com.